Thirty-Five 23-Minute Messages. Over 13 Hours of Teaching. Listen, and you will hear echoes of their ideas in your daily conversations — especially as you witness to unbelievers. This series was what first introduced me into the huge world of philosophy and worldview, which has been an indispensable part of my growth as a disciple. It's a very brief survey, but highly recommended for anyone new to philosophy. Easy to understand and remarkably well applied to the contexts of our own current cultural situation, and will leave you both very excited and prepared to delve a little deeper. Another classic by Dr. Sproul! Far Superior than a Seminary Course! After taking a seminary course on the topic I knew that some form of supplement was needed because I retained so little. Dr. Sproul is a master-teacher when it comes to this topic. Easy to comprehend and connects to the Why Question. A must for all Pastors, Teachers and lay Educators! All of us in the Western World think differently as a result of previous philosophers and this is not necessarily good. Knowing this will help one interact with the ideas that harmful to Biblical Christianity. Extremely valuable but has a prerequisite. I knew almost nothing about the teachings of the ancient and modern philosophers and Dr.Sproul certainly gave me a good overview in this course. However, after watching this course I then purchased the Ligonier series &quot;Defending the Faith&quot;. What I found was that it would have been easier to wade through the various philosphers found in &quot;The Consequence of Ideas&quot; had I watched &quot;Defending the Faith&quot; first, in which Dr.Sproul also talks quite a bit about the consequence of philosphic ideas. I'm going to go back for a second viewing of &quot;Consequence of Ideas&quot; and I will be able to appreciate it that much more. This was an outstanding overview of Theology/Philosophy from Socrates to Present Day. A normally dry subject made interesting. It helped me to better understand &quot;how we got here from there&quot; with respect to the current relativism that is so prevalent today. It also helped demonstrate that there really isn't anything new under the sun, just man's recycled fallen perspective on the meaning of life and being. A clear and concise outline of the evolution of philosophy. Dr. Sproul compares differing philosphies and compares them to each other and our reformed view of the world. I came away with as understanding that many of our ancestors thought much more deeply than we do. R.C. is a wonderful teacher. superb sampling of the flow of western philosophical development and issues! 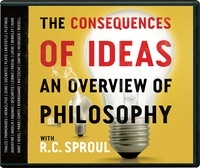 Be sure to check out Sproul's book form of this by the same title, Consequences of Ideas. It's a bit more concise, but it still gets many of the same points across.